The last session was an unusual night for my players. In the regular game, we left off with their characters spending the night at the Whispering Moose Inn, somewhere in the Imperial City. A few NPCs had been delivered to their destination, Milo had successfully bonded his new pony as a familiar, Arlen had begun looking for information about his "Talon," and Hapex had met a rather conversational cleric named Galen. But when the players first arrived I said "Tonight we're doing something different." I handed out new character sheets, explaining that each of their characters were members of the Boeruine Army stationed in the Five Peaks. 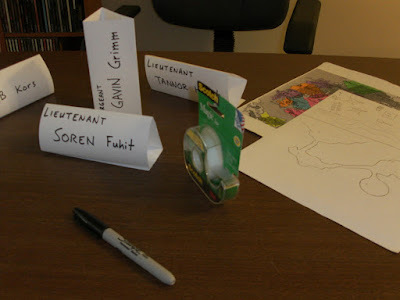 Each of them was selected by the Archduke of Boeruine himself to be a part of this quest, and I handed out character backgrounds that explained who they were playing and what their motivations were. The quest that they had been sent on was to exploit a diamond mine along a ridge of the Gorge, the westernmost mountain of the Five Peaks - a goblin-infested warren of forests, valleys and mountains. I assigned the characters to each player to try and exploit their strengths, and their weaknesses, as players. When I wrote the characters up I decided to assign very specific Virtue-Vice combinations to further exploit their playing styles. I did a lot of prep work to make sure everything ran smoothly and nobody would feel too unhinged by the dramatic shift in the game session for the night. Half of the prep work is ironic to me, because in the end no matter what happens at the end of this scenario the rules are incidental and don't matter. The main villain can't really be 'hurt' - but the players could do plenty of damage to each other! After a few minutes of reviewing their orders, and their character sheets, I asked if everybody was ready, and I turned off the lights, played sound effects of howling wind and rain for a full minute, then read the introduction. "You have been assigned a special quest by Archduke Aeric Boeruine himself, and for the good of the nation of Boeruine. Your team has scaled the westernmost mountain of the Five Peaks for the purpose of exploiting a diamond mine. The mine is unknown to the neighboring countries of Talinie or Tuornen, and if the native goblins had any way of exploiting it they would have. It is imperative you not alert Talinie to your presence and retrieve as many diamonds as possible. The Archduke plans on using the wealth from these diamonds to further legitimize his succession to Emperor of Anuire. Captain Hab Kors is the commander of this quest. He has been assigned four officers to assist him as well as twelve soldiers. As of this time one of the lieutenants, Faezil Klaran, and half of the soldiers under his command have fallen ill and are bed-ridden with a fever. A nearby tribe of goblins has been providing slave labor for your quest." The Captain was woken from his sleep by one of the soldiers reporting that at this late hour something had been uncovered in the mine. Being disgruntled at having been woken, he dismissed the soldier, but enough of a commotion was caused in camp that the other officers were roused and Sergeant Grimm commanded three of the men to follow him along with ten goblins into the mine. The other two Lieutenants followed. They found a passageway in the mine, fifty feet below ground, where a section of rock wall had crumbled away to reveal a small but ancient goblin altar before a set of giant doors embedded within the rock. A giant circular seal made of gold held the doors together. The Lieutenants spent a great deal of time examining the arcane symbols and scratch marks made along the surface of the seal, but could discern nothing of note. The Captain soon arrived in the mine, still groggy and upset at having been woken, but suddenly pleased at the enormous golden seal that had been uncovered. "This is far more wealth, and far easier to carry out, than having to dig for diamonds!" The goblins were commanded to chip away at the rock holding the seal in place, and as the officers debated how they would break the gold down and remove it from the mine, it slid and fell out of the doorway, crushing three of the goblins flat. All of them got a better look at the seal now that it was out of the doorway, and they saw it was at least eight inches thick. They surmised that if the door was solid gold, that it was worth more than all of the income in every country they had ever heard of across the land! The soldier who woke the Captain was commanded to lead the way into the entryway behind the seal, and the party soon discovered the remnants of an ancient temple. The Lieutenants and the Sergeant began experiencing visions while interacting with the relics, scrolls and other gold pieces found inside. Soon they were commanding the goblins to handle everything and put the relics into bags without directly touching the items themselves. During this time, Lieutenant Tannor slipped away, hoping to rouse the goblins back at camp into fighting and killing the other soldiers. When he arrived back at camp, however, there are too many soldiers milling about for him to do it discretely, and he witnesses an apparition. A man, dressed in tattered black robes and a crudely beaten copper crown, taunts him, telling him that he had better work fast and kill everyone if he will have any hope in stopping the spy in their camp. Back at the cave, the goblins seemed to begin suffering from their own visions and mania, they began fighting each other and one of them bit Lieutenant Soren's hand, which had already been burned from some sort of black ooze found in the temple's main hall. Lt Soren and Sgt Grimm began killing the remaining goblins, and the Captain also began to hear voices and experience visions, as they all ventured back toward camp the Captain became convinced that Lt Tannor needed to be made an example of for leaving them in the mine without asking for permission. As they returned to camp, Tannor had lit the Dwarven Fire in the supply tent and flaming balls of slime rained down upon the remaining soldiers and goblins, all of them fighting in the wet mud. Tannor managed to kill the Captain with a crossbow, and Sgt Grimm ran to the dog kennel in hopes of releasing the dogs to go after the rebellious Lieutenant. Lt Soren worked his way to the mess tent, only to see that all of the other soldiers were dead, and he witnessed another apparition, this time of a giant. Ten feet tall, eight eyes, spider mandibles working in it's mouth. It spoke to him "Would you like some help?" and he said "Yes, please!" A path was shown for him to slip away from camp during the chaos, and he took it. But the path snaked upward along the mountain, which afforded him a decent view down upon the remaining events. The fight between Sgt Grimm and Lt Tannor continued. Grimm let the dogs in the kennel loose, but they turned upon him viciously and he spent precious time dispatching them while Tannor shot several crossbow bolts at him. Still standing, but bleeding from the neck, Grimm took cover behind a tree and bandaged his wound, but Tannor quickly closed the distance between them and managed to stab him through his eye socket. Soren witnessed all of this from his vantage point, and he thought he saw Tannor overwhelmed by goblins who had circled around the camp. But it was raining. The wind was hard. 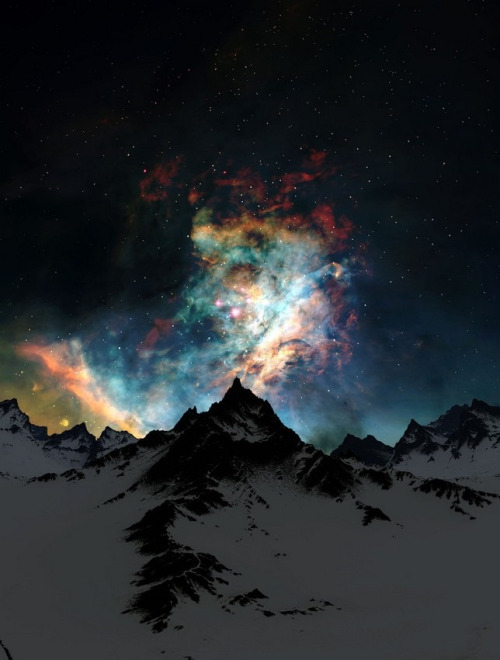 He was experiencing visions of alien and ancient creatures, in a land rich with magic and untouched by human hands. He couldn't be sure of what he saw that night, any of it. And at this moment, I took the character sheets and personality descriptions away from the players and revealed that this episode had been narrated to their regular characters in the Whispering Moose Inn by Galen, a cleric that Hapex had met the day before. In the story he was Lt Soren, who was a spy for Tuornen, whose real name was Arthur, and who was known to them now as Galen. He had heard of Hapex the Goblinslayer, and he wished to join their party. Perhaps in the hopes of returning to that dread place high up in the Five Peaks, and returning those goblin devils to the hell they had caused. Or perhaps simply of finding some peace for himself in the comfortable service to a man whose reputation for goblin killing preceded him in every town. I quickly explained that Arthur/Soren/Galen's story was being told to all of them at breakfast in a private room at the Whispering Moose Inn, and allowed the players to take in everything they had experienced firsthand as part of this story. Almost immediately, the questions began to fly. Who was the robed man? 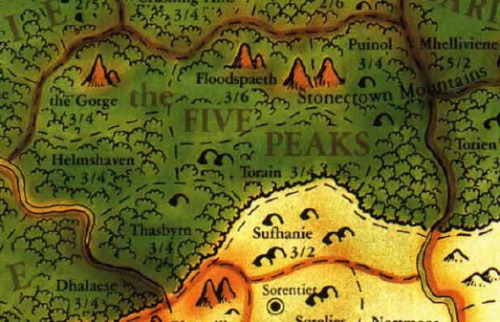 Do we know how many giants are in the Five Peaks? Arlen specifically said "We should go back there and get that gold!" The most important information for Milo was that Galen referred to the apparition as the Cold Rider, and halfling folklore spoke of the Cold Rider as a malevolent and insidious entity that had driven the halflings from their homeland over a thousand years ago. He vehemently opposed stepping anywhere near that mountain! Overall, the session was a lot of fun! 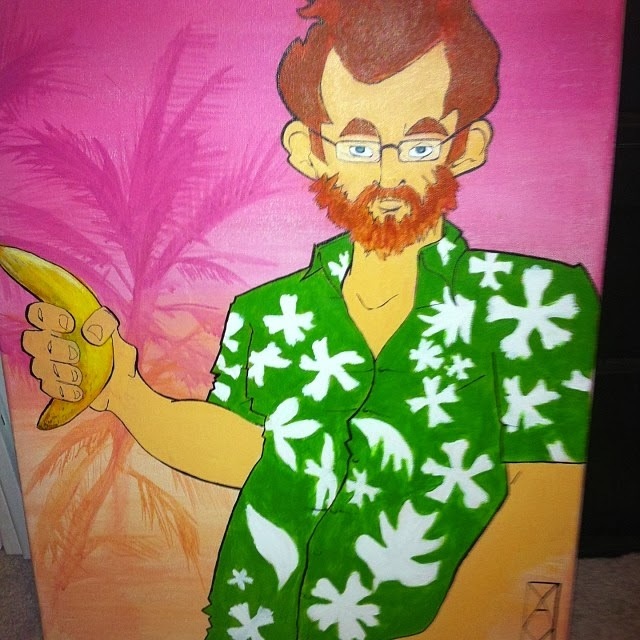 Vince remarked that it was a neat technique to have a story told by the players like that, because he would certainly remember it better than if I had just narrated the events from the voice of an NPC, at which point I had to reveal that I really didn't know how it would end. I needed at least one survivor to be able to relate the tale, which is why there's a sick Lieutenant back at camp, Faezil Klaran. To which everyone remarked "Oh yeah! What happened to him?" Jake was upset that I "narrated" his Lieutenant into a dying situation, ambushed by goblins returning to camp, and I said "Well, Galen is not exactly the most trustworthy teller of tales. Who knows if any of it really happened." This only seemed to upset Jake more, "I know it happened!" I'm grinning again just thinking about it. During the adventure Colin figured out how much the gold seal would have weighed - ten tons! And the relative wealth in the game world would be 50 million gold pieces. Yeah. That's right. Who knows if any of it really did happen? I have to give credit where credit is due. This whole session never would have happened if it hadn't been for John Wick's brilliant writing for Digging for a Dead God. 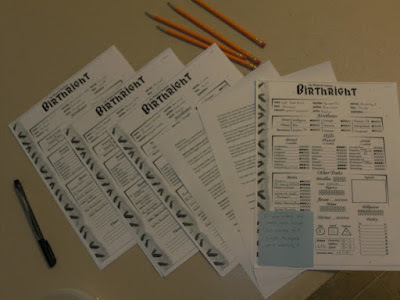 I decided to adapt the adventure to my campaign as best I could and I left some things out, I also only have four players - not six, and my game IS set in the Birthright campaign setting (think AD&D Dark Ages Highlander) using house-ruled New World of Darkness rules. Adapting a Call of Cthulhu adventure to that is a little bit of a struggle, but I think it worked pretty well and I managed to make it fit into my overall narrative. The original adventure is set in 1930s Germany, with the players as Nazis and having access to dynamite (which I referred to as "Dwarven Fire") and machine guns (crossbows). The diamond mine is located in Africa and the "goblins" are actually native Africans. Each soldier and officer was decked out in armor and carried a sword, a dagger and a shield; but only the PCs knew how to use the 'Dwarven Fire' which I treated just like dynamite that turns into napalm when it explodes. In the character background for Lt. Tannor Hemut I revealed that the secret of 'Dwarven Fire' had been tortured out of captive dwarves back in Boeruine, and the location of the temple had been revealed in these same dwarven interrogations. The original adventure has six pre-written characters, so I took background elements from two characters and combined them to make Soren a spy with a bit more of a backstory, and the extra sixth character I simply thought of as Faezil, the sick Lieutenant who is absent throughout the scenario. My players have never met anybody from the nation of Boeruine, and with this adventure I have begun to set that country up as future villains for the campaign. The players actually did a good job of being ruthless bastards without realizing the Nazi connection as well. Finally, the original adventure is about the Yellow Sign, a symbol of Hastur from the Cthulhu mythos. In the Birthright setting there are a few references to how halflings are not from Cerilia but originally lived in the Shadow Realm, and there were only ever two references in the campaign books to a terrifying being who drove the halflings from the Shadow Realm called the Cold Rider. The main entry in the Birthright rulebook only contains one paragraph and is written in very vague terms. It says the halflings fled from "a terrible danger" that common folk call the Cold Rider, and in other regions he is called the Night Walker or the Darkling. The paragraph ends with "the borders between the Shadow World and Cerilia have grown weaker in recent years, and strange things have been happening in the frontier lands..."
In earlier games I never gave the Cold Rider much thought, the references are too vague to make something substantial out of it, but my experiences playing Deadlands with Everett gave me a huge appreciation at adapting Cthulhu-esque monsters and situations to a game in order to make it more terrifying. In my mind the Cold Rider is very much an ancient, alien entity who would normally not pay attention to mortals, but has found that pain, especially the pain of the cold, gives him delicious morsels of psychic energy to feed off of. And like the Man in Black of the original scenario, simply knowing he exists gives him an opportunity to feast upon your pain. In previous sessions the players ventured close to the Five Peaks, and they met a few insane people who were living around there. They didn't give it much thought at the time, but now I may have to hammer home that the Cold Rider is in those mountains, and anybody who goes there is subject to his will. As an additional note, I always describe my world to my players as "the middle ages just before the Renaissance hits" and in discussions about the governments, religions and society in general I always remind them that "Renaissance" for a fantasy world means that magic hasn't become common yet, nobody can read and people are struggling just to maintain the status quo of survival. Magicians and wizards are looked at suspiciously. There is only one college of sorcery in all of the land and it's located in the Imperial City and is more of a political font than an actual place of study. Nobody is really educated. Nobody really knows... anything. At this time in the world knowledge is being increased, productivity is taking hold, the humans are spreading out, and wars are brewing as nations buckle around the edges. A perfect time for dropping the equivalent of an elder god who feeds on pain and extinguishes warmth into a collection of countries all rattling the lids of their boiling pots.